Cute New Sewing Box Sets! Store your stuff in style with our new sewing boxes! The sweet storage sets have a lunchbox shape and a shiny laminated surface. One set features adorable bunnies, the other has a floral theme. Both include sewing designs, too! From needles and thread spools to rows of garments. You get all three boxes in a set. Just right for stowing all your sewing supplies! Treadlette Tuesday: Ardus Recommends Textile Exhibits! This week, Ardus is sharing some local textile events she's hoping to attend! "If you're searching for some unusual textile and/or garment exhibits in the Twin Cities, I've recently discovered two very accessible and fun exhibits. I'm always searching for something different, and I found it at the American Swedish Institute, conveniently located in the heart of Minneapolis. "Recently reviewed in the Star Tribune, it was described as 'old-meets-new' concept for the garments on display. The exhibit is entitled, 'The Weather Diaries'. ASI is located at 2600 Park Ave S.
"Another is an Ikat textile exhibit, a bit more traditional, can be found in the Goldstein Museum at the University of Minnesota, St. Paul campus in McNeal Hall. I've always appreciated exhibits at this museum, and you won't be disappointed. "Ikat patterns are both intricate and bold, and those on display are from locations such as Central Asia, Indonesia, Thailand, Cambodia, Uzbekistan, Japan and the South American Andes will be on exhibit. Central Asian Ikat patterns date back to the days of Genghis Khan. Curious? I am. Located at: 364 McNeal Hall, 1985 Buford Ave, St. Paul." It's officially spring here, and what better signifies spring than adorable bunny rabbits? We have loads of cotton prints with bunnies, both cute and classy. Take a look! If you loved the digital linen prints we shared last week, take a look at these digital knit prints! Large-scale, incredibly detailed prints adorn these drapey jersey knit fabrics. What's not to love? Today's Treadlette project comes from Sue. She used bright red, one of her favorite colors, to make this charcoal grey knit pop. Red accents are created by the jersey binding, buttons, and pocket lining. The pattern is Vogue 9244 by Marcy Tilton, a cute knit jacket with a hood and a subtle high-low hem. Find your perfect spring jacket today! 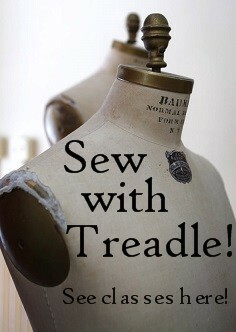 Stop by Treadle and get inspired. We have a bunch of brand new printed linens with a unique feature: they're digital! Digital printing enables manufacturers to create complex, large-scale prints with exquisite detail. Take a look at the sweet detail on this bamboo and bird print. Stop by and see these gorgeous digital linen prints for yourself! Spring Pattern Books are in at Treadle! Plan ahead and start your spring wardrobe now! Remember, we've got everyday discounted prices on most major pattern brands: ALL Vogue patterns are just $12, Kwik Sew patterns are $10, and Butterick and McCall's are only $7.50! We also carry plenty of small designer patterns! Petite Plus, Colette, Decades of Style, and Sewing Workshop are just a few!